Occultism. The Key of Nature / A Monthly Magazine. Dorchester, MA. Editor: Joseph M. Wade, editor and publisher. 1/1, June 1891. 12-16 pp., 7 x 11, $1.00 a year. The Path in 1894 notes the appearance of the journal as a new magazine, so there must have been a hiatus in publishing. 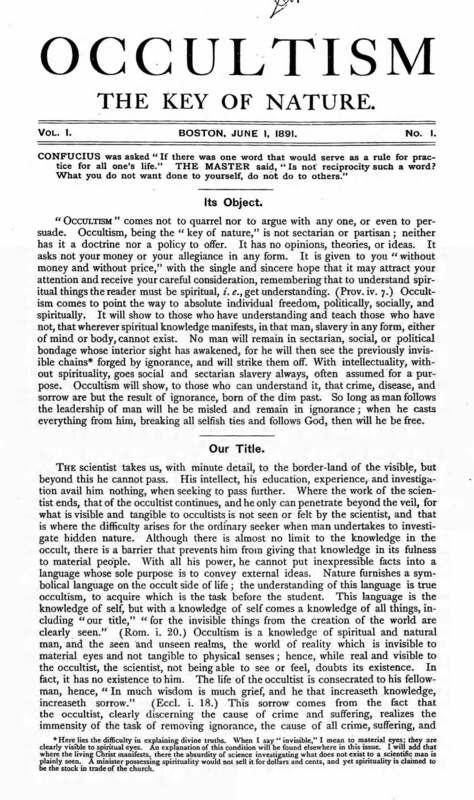 Advertised in Foundation Principles, October 1893 (which offered both magazines for $1.00 a year), and noted in exchanges of Übersinnliche Welt, 1893, and in Miscellaneous Notes and Queries 12/5 (May 1894), which says that the "contents, every line, is full of thought, and developes the inner man in a spiritual degree that will be lasting to a soul desiring light." (The spelling, presumably, is that of Occultism's editor rather than of the editor of Notes and Queries.) Wade (1833-1905) was an English immigrant who made his fortune in the textile business and then turned to the occult and soon began to receive his own revelations which he automatically transcribed on the typewriter. He wrote practically the whole journal, which was verbose and rather vague in what he advocated, except for his dislike of Freemasonry, Catholicism and the Theosophical Society. He was the publisher of Blavatsky's Posthumous Memoirs (1896). and was said in his obituaries to have had an "occult room" filled with Japanese art objects. The surviving issue of the journal notes that Wade's teacher was Franz Hartmann. Rowell's American Newspaper Directory for 1900 says the journal had a circulation of less than 1,000.